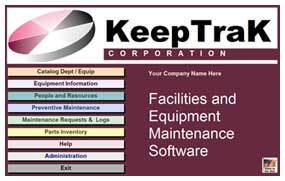 Preventive maintenance business software by KeepTraK Corporation is full of features to provide facility maintenance, equipment maintenance and site maintenance as well as work requests, work orders, parts inventory and purchase orders all in one software package. Companies, service departments, medical facilities, water districts, fire departments, assembly sites and manufacturing companies that need a robust easy to learn and use, equipment preventive maintenance project software program do not need to look any further. Why Preventive Maintenance and Work Request Software? Comply with regulatory requirements such as OSHA, USDA FDA EPA, ISO 9000, ISO, QS9000 etc. Saves money – properly maintained equipment cost less to operate. The real cost is not having CMMS software – for example you wouldn’t not change the oil in your car to save $20 when you would soon spend thousands for a new engine. Planning and Scheduling. Is it always one crisis or emergency after another? You cannot afford the cost of NOT having KeepTraK Facilities and Equipment Maintenance with Parts Inventory software. The return on your investment should be in months not years. One missed task could lead to a breakdown costing many times that of the software. Not to mention overtime, downtime, replacement etc. 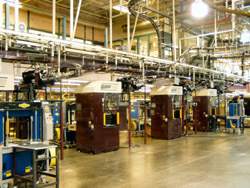 Reduced maintenance and operating costs that come right off the bottom line. Value. Included are many features and functions that will not cost but SAVE you time and money. Longevity. 20 years in business – there are only a few competitors who have been in business as long as we have. Our software is time proven in a variety of scenarios. Microsoft Office Compatible. Why not use the world standard. Why buy some proprietary database to save a hundred dollars only to have a useless database in a few years and lose countless hours and dollars. Buy only the modules you need. You can add others later. Bottom up software – most CMMS software is designed to appeal to upper management. 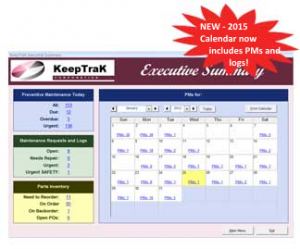 KeepTraK software is designed with the user in mind. Simply, what need to be done, by who and when. Free help with set up and data entry – get you up and going the same day. Why spend a week going through the learning curve of other programs when we can have you up and going in an hour or less. Simple to use 3-5 minutes a day to do what currently takes hours. American owned and operated. Everything is right here in the good old US of A. We provide our own customer service in house. We do not outsource our customer service. Available during regular business hours for assistance – (24/7 by request for FREE for customers who work night and weekend shifts as well as other time zones ex: Australia, United Kingdom etc). We understand not everyone works bankers hours. Manufacturers and manufacturing companies find KeepTrak Preventive Maintenance software makes ISO9000 and ISO9001 standards easier to maintain using our software. Why spend hours and months preparing for ISO compliance inspections when KeepTraK software can do the job in minutes. Full listing of all equipment and the associated maintenance to make ISO compliance standards inspections a breeze. Complete reports included to verify ISO Compliance using KeepTraK preventive maintenance software. We have the software that can help you achieve and maintain JCAHO accreditation. Joint Commission standards and compliance reporting is easy with KeepTraK software. Hospitals, Nursing Homes, Care Facilities all enjoy the cost and time savings of our software. Compliance with other regulatory agencies is easier with KeepTraK software for Facilities and Equipment Maintenance. OSHA, EPA, AIB (American Institute of Bakeries) etc etc are just some of the regulatory agencies our software works for. Factories, Factory Maintenance software, Manufacturing and Manufacturing Maintenance and Manufacturing Preventive Maintenance software. CMMS, EAM software for Preventive Maintenance with work request, work orders and parts inventory software. Apartment Management maintenance software, Condominium Associations, Office buildings, Hotels, Motels, Resorts and Ski Resorts all benefit from KeepTraK software for facility and equipment maintenance with parts inventory. Task scheduling, corrective maintenance and breakdown maintenance for Governments, Cities, Water treatment plants. 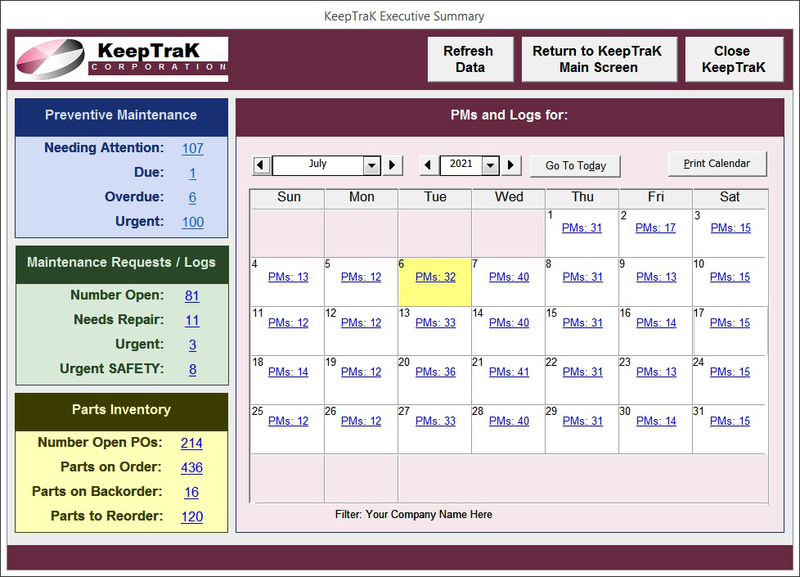 Utilities, Military bases and installations also use KeepTraK planning software for equipment and facility maintenance.